Novel insights into protein structure and protein-protein interactions may be obtained using its Q Exactive ultra-high mass range (UHMR) mass spectrometer, says Thermo Scientific. The instrument enables structural biologists and biopharmaceutical scientists to high perform quality native mass spectrometry and top-down analyses. 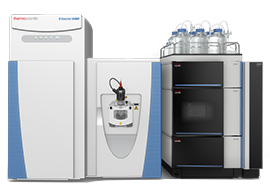 The Q Exactive UHMR Hybrid Quadrupole-Orbitrap is the first platform from Thermo Fisher Scientific to combine high resolution, high sensitivity, MS2, and pseudo-MS3 capabilities. It overcomes previous limitations that prevented native mass spectrometry from achieving its full potential, says the company. “To unlock a understanding of proteins and their interactions, we require substantially increased sensitivity and mass resolution at high m/z,” said Albert Heck, professor of biomolecular mass spectrometry and proteomics at the University of Utrecht. “This instrument enables high-fidelity, hypothesis-free mass analysis of intact ribosome particles, revealing the substoichiometric association of even elusive small proteins”. The instrument is designed to resolve the small differences in masses required to characterise intact biomolecular assemblies and other large molecular complexes. It uses cryo-electron microscopy (cryo-EM) to verify sample quality before analysis and determine sample composition and homogeneity.